Are all inversion tables the same? 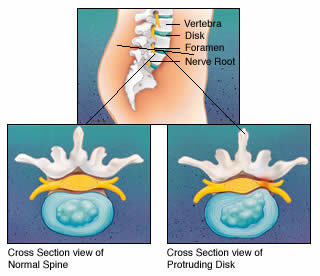 3) Discs - spongy material that separates your vertebrae, allowing the nerves to run between each bone segment. Discs act like shock absorbers and allow the spine to flex. To understand the sources of your particular back problem and/or how to prevent back pain, it helps to understand the anatomy of your spine. Each vertebrae is held in its proper place by three different kinds of soft tissue-discs, ligaments, and muscles. Almost all back problems are related to the dysfunction of one of these three. The natural curves of the spine are vitally important for giving your back strength and resilience. There are 26 vertebrae in your spinal column. The lumbar vertebrae are approximately two inches in diameter reflecting their weight-bearing role. The cervical vertebrae are smaller, since they must support only the head. Facet joints are located in pairs on the back of the spine, where one vertebra slightly overlaps the next. 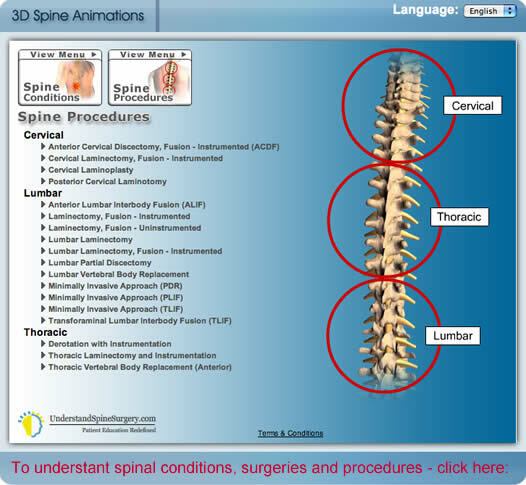 The facet joints guide and restrict movement of the spine. To the rear of each vertebra is a hole and when the vertebrae are stacked up, these holes form a continuous channel which holds the spinal cord. The spinal cord provides a vital link between the brain and all body functions below the neck. Spinal nerves emerge from the spinal cord through gaps between the main body of the vertebrae and the facet joints. One frequent cause of back pain is a worn facet joint, which can result in a pinched nerve. Therefore, it is very important to keep your vertebrae in good shape. Today back pain is one of the most common of all physical complaints in the world. About 70 to 90% of men and women in the U.S. have had or will have a least one bout of incapacitating low back pain. Back pain contributes to lost work time and may cost as much as $100 billion annually (if lost productivity is included). Low back pain can be acute or chronic, manifesting in the lumbosacral region and associated musculoskeletal structures. Low back pain is extremely prevalent. Low back pain can become a life long struggle. When performing even the simplest tasks of everyday life, we may turn, twist, lift, and either push or pull something the wrong way and be crippled with low back pain that is constant and debilitating in nature. Low back pain injuries may often be overlooked and under diagnosed. Consequently, the injuries may progress and delayed initiation of appropriate therapy may prolong the treatment course. Low back pain injuries may be as simple as muscle aches or as severe as spinal cord paralysis from lumbar compression secondary to osteoporotic fractures. Spinal decompression is the way to reverse this problem and the best technique known for accomplishing spinal decompression is using an inversion table in the convenience of your home. Back pain in the lower back or low back pain is a common concern, affecting up to 90% of Americans at some point in their lifetime. Up to 50% will have more than one episode. Low back pain is not a specific disease. Rather, it is a symptom that may occur from a variety of different processes. In up to 85% of people with low back pain, despite a thorough medical examination, no specific cause of the pain can be identified. • Low back pain is second only to the common cold as a cause of lost days at work. It is also one of the most common reasons to visit a doctor's office or a hospital's emergency department. • For 90% of people, even those with nerve root irritation, their symptoms will improve within 2 months, no matter what treatment is used—even if no treatment is given. • Doctors usually refer to back pain as acute if it has been present for less than a month and chronic if it lasts for a longer period of time. This drawing shows a normal disc. The main function of your discs is to act as shock absorbers and provide separation between each vertebrae. The outer layers of your discs are formed from tough cartilage. The inner core of your disc is a jelly-like nucleus. 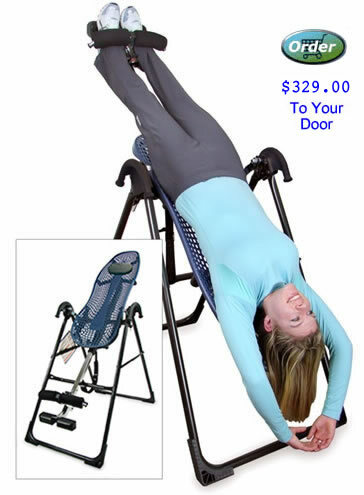 problem and the best technique known for accomplishing spinal decompression is using an inversion table in the convenience of your home. With no blood supply of its own, the disc is dependent on sponge action for attracting and absorbing nutrients from adjacent tissues. During non-weight bearing activities (sleeping) the discs expand as they soak up fluid, increasing the length of the spine by as much as one inch overnight. During weight bearing activities (sitting, standing, exercising), this fluid is squeezed back into the adjacent soft tissue. Low back pain can range from acute to chronic. Ranging from a dull, intermittent, nagging ache to an unbearable, tear eliciting pain. Your vertebra are supported and moved by many different muscles. Muscles are used for three basic functions; support, movement, and posture control. If muscles are tight or weak, they create or worsen back pain. Joints are controlled by at least two sets of muscles, flexors which bend the joint, and extensors which straighten it. In addition, most joints have rotator muscles that twist and rotate your bones. Good posture is only possible if the flexors, extensors, and rotators are in proper balance. Your paraspinal muscles (which run parallel to your spine) rotate your spine, bend it backwards, and sideways, and influence posture by creating and maintaining the curves of your spine. Your erector spine muscles are involved in movement and run the length of your spine. These muscles help you to bend over by resisting the force of gravity, and to straighten up by contracting and exerting great compressive force on your spine. Your abdominal muscles play an important role in helping to support the spine by maintaining pressure inside the abdomen. This pressure is an essential measure of counter support to the spine. Your psoas muscles (hip flexors) are a large group of muscles in the abdomen. These muscles help to flex your hips when walking or climbing stairs. They play an important role in maintaining posture for sitting and standing. Intravertebral joints are supported by ligaments, tough and inelastic fibers which support the spine and hold it together by allowing only a limited range of movement in any one direction. Ligaments require regular movement and loading, otherwise they will eventually become stiff and weak. Using the inversion table can give an excellent controlled workout to the muscles and ligaments necessary for a healthy spine. We need strong back, abdominal, and hip muscles to resist gravity and to hold us up. Besides holding us up they act to keep the spine and pelvis in alignment. As societies around the world become more mechanized and computerized, they have also become less exercised. We lock ourselves behind desks and in front of computers. When we sit, our back muscles hold us erect, but our stomach and hip muscles are inactive. When they are not exercised, stomach and hip muscles become weaker, putting a painful strain on the back muscles. Sitting places higher loads inside the lumbar disc than standing (between 150% to 250% depending on posture). A ruptured disc in the back occurs when all or part of the soft, gelatinous central part of the vertebral disc is forced through the bones of the spinal column. What is going on in the body? Sandwiched between the vertebra of the spinal column are discs that act like shock absorbers. A disc is made up of two parts. The outer ring or annulus is a tough, fibrous material. The inner part or nucleus is a soft, jelly-like material. A ruptured disc occurs when the outer ring tears or break, allowing the jelly-like material to poke through the crack. This can result in pressure on nerves, often causing pain. Sometimes leading to sciatica & leg pain. The terms ruptured disc, slipped disc & herniated are often used in the same context. There is an enormous body of evidence that a compressed disc, whether or not it is actually ruptured can be aided by inversion therapy. Inversion increases the intervertebral space and allows the disc to return to is shock absorber and spacer function. Spinal decompression is the way to reverse this problem and the best technique known for accomplishing spinal decompression (reverse nerve impingement) is using an inversion table in the convenience of your home. There is an enormous body of evidence that shows a compressed disc, ruptured or not can often be aided by inversion therapy. Spinal decompression is the way to reverse these problems and the best technique known for accomplishing spinal decompression is using an inversion table in the convenience of your home. The cardiovascular system is your body's transportation system, carrying food and oxygen to your body's cells. Oxygen-rich blood from the lungs travels out through the arteries and waste-filled blood comes back through the veins to be cleansed and recharged with oxygen. Because your body must work against gravity to retrieve blood from your legs and lower torso, inversion can help to ease the circulation process by placing your body in a position that utilizes gravity's force in your favor. Unlike the cardiovascular system, the lymphatic system has no pump. Only the alternate contraction and relaxation of muscles moves lymphatic fluid through capillaries and one-way valves to the upper chest for cleansing. Inverting the body so that gravity works with, not against, these one-way valves helps to push the fluid up to the chest. In her book Beyond Cellulite, Nicloe Ronsard discusses the role of the lymph system in creating cellulite, and ways in which people can help stimulate lymph flow to reduce cellulite. She explains that when the flow of lymph is slowed down, a stagnation of fluid occurs in the tissues. In areas where circulation tends to be poor and as in the hips and thigh area, this stagnation encourages the formation of cellulite. By reversing gravity's force on the flow of blood and lymph fluids in the body, you can increase the nourishment of cells and accelerate the removal of wastes. The rocking motion that is easy to do on the Teeter Hang Ups inversion tables is excellent for stimulating lymph and blood circulation. Sciatica caused by Piriformis Syndrome is only one of several conditions that can cause sciatica which is the pain you may feel in your hip, buttocks and going down your leg. Usually it is felt on one side. Piriformis Syndrome causes sciatica by irritating the sciatic nerve which is the largest nerve in the body. The nerve passes through the hip on the way down to the foot. Piriformis Syndrome may be difficult to diagnose because often the main cause of sciatica is a compressed disc. This can usually be reversed with the conservative use of an inversion table. Most people who have sciatica will have one or more conditions causing it. The compressed disc is one and pelvic tilt leading to Piriformis Syndrome is another. Often the muscles that align the pelvis are out of balance leading to a tilted pelvis and one leg being shorter than the other. When this happens the path of the sciatic nerve may be irritated when it comes in contact with the Piriformis muscle. If disc compression is not the problem or has been reversed and your doctor feels mild exercise is appropriate these three simple exercises may have a tremendously corrective effect on the pelvic tilt issue that may causing Piriformis Syndrome. 1. All Fours Leg Thrust - Get on all fours like you are going to crawl. Thrust out the right leg up and back & then the left. You may want to do 10 reps with each leg. It is good to vary the position of the foot so it is sometimes perpendicular to the ground and sometimes parallel to the ground. Start out with a mild workout and if well tolerated work these muscles everyday until they are quite strong. 2. Standing Leg Thrust - This is a variation on All Fours Leg Thrust. You can do this standing. Hold on to a sturdy dresser or table about waste or abdomen high. Lean forward and kick your leg back and up as if you are trying to kick someone directly behind you. It is good to vary the position of the foot so it is sometimes perpendicular to the ground and sometimes parallel to the ground. Do an equal number of reps with each leg. Try if you can to work up to the point that when you kick your leg out it is parallel to the ground. 3. Stair Climbing - Start gradually and work up to a 5-10 story building 2-4 times a week. These exercises work directly on the gluteus maximus, psoas and other muscles to help strengthen and balance the muscles that if imbalanced can tilt the pelvis and exacerbate compressed disc and irritated nerve problems. I'm just writing to say how completely happy I am that I bought your F5000 Inversion Table. I was having severe problems with my back. A trip to the Dr. and ultimately an MRI revealed I had severe calcium deposits (from arthritis) built up around my sciatic nerve. This resulted in my having to walk bent over just to slightly reduce the severe pain I was experiencing starting at the buttocks and going all the way down to my ankles. I was really depressed when my orthopedic Dr. was recommending I see a spinal surgeon. After having surgery for both 2 hips and 2 knee replacements I was not exactly enthused about the prospect of back surgery. I told the Dr. I wasn't ready for that option just yet cause my wife had seen an article on Inversion Tables and how they can help people with herniated discs and sciatic problems. I was skeptical but when I saw your free trial offer, I figured what have I got to lose, so I bought the F5000 Inversion Table. At first I didn't think it helped, however after just 2 weeks use I could walk upright again and have very little to no pain any longer. Don't know how long this table will help me, but each day I can put off back surgery I'm thankful for. Feel free to use this testimonial. I'm thankful I listened to my wife and decided to try this table. The sciatic nerves are the largest nerves in the body - about as big around as your little finger. They start in the lower spine, pass behind the hip joint, and go down the buttock and back of the leg to the foot. Pain from this nerve, called sciatica (a form of nerve impingement) , may be felt from the hip to the big toe. Sometimes the nerve is pinched between vertebrae, or its passageways are narrowed by arthritis or swelling of a sprained ligament in the area, and it becomes irritated and tender. A disk (the cushion between the vertebrae) may bulge out of place and press on the nerve (impingement) . Rarely, an abscess, blood clot, or growth may push on the nerve. At times, no exact cause is found, but a movement that is normally harmless (such as bending over) suddenly brings on violent pain. Is sciatica different from other types of back pain? Yes, although low back pain often comes with it. Usually, sciatica affects only one side. Pain often radiates down the buttock or leg. It can range from a tingling, burning, pins-and-needles feeling to excruciating, shooting pain that makes standing up nearly impossible. Coughing, sneezing, and sitting make the pain worse. Your leg or foot may be numb or weak and have odd sensations in it. You may be unable to move your foot or bend your knee. Spinal decompression is the way to reverse this problem and the best technique known for accomplishing spinal decompression (reverse nerve impingement) is using an inversion table in the convenience of your home. In most cases sciatica as well as cervical disc compression is a mechanical problem. Probably the best mechanical solution in the world is an inversion table (hanging at mild to moderate angles and including some oscillation) along with an exercise program (see below). This two prong approach works to decompress the the discs which may be desiccated (dried out) due to chronic compression. And to balance out the muscle strength in the front , back, left and right sides of the pelvis to reduce pelvic tilt. Our company has been working with back pain sufferers since 1980 and the feedback we have received from the more than 12,500 people we have sold tables to are testimony to how well inversion therapy works. Traction was the therapy of choice by the medical profession for hundreds if not thousands of years. It is amazing how often they overlook this simple therapy in this age of drugs and surgery. Another component of healing and regeneration is nutrition. Our company has also been involved in the field of nutritional supplements for many, many years. There is a very compelling argument made by researchers & nutritionists that many if not most people are mineral deficient. The bases for this claim is that plants are grown with synthetic fertilizers on mineral depleted soils. The best mineral supplement we have ever found that has resulted in improved health for thousands and thousands of people is New Vision's Essential Minerals. They are derived from organic plants and have about 70 major and trace minerals that are easy to absorb in a delicious lemon-lime drink. For any health plan to be most effective it is good to know that your basic nutritional needs are covered. We would also recommend New Vision's Essential Calcium. To learn more about sciatica, diagnosis and treatment of piriformis syndrome take a look at sciatica.org. The video is demonstrating the Spine Med Decompression system. Inversion therapy accomplishes much the same. Discs are soft, rubbery pads between the hard bones (vertebrae) of the spinal column. When they are young and healthy, discs are plump with water, which keeps them hydrated and they have the perfect consistency to work as shock absorbers for the vertebrae. They also act to maintain the space between the vertebrae so the nerves are not impinged upon. 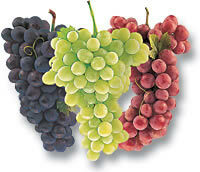 Over time the daily stress of gravity, sitting, twisting and the process of aging may dry them out like grapes turned into raisins. This is called desiccation. This disc desiccation or drying out can be reversed and the disc can be rehydrated. As discs deteriorate, their tough outer shell weakens. One swing on the tennis court or lifting in the wrong way can burst the interior gel through the caseing, like jelly squishing out of a doughnut. act as shock absorber and spacer. With mild inversion the vertebrae are separated allowing the discs to regain their form and function. After the pressure is taken off the nerve there can be a rocking motion added to the inversion therapy. The rocking motion creates an accordion like pumping action that helps to hydrate and increase the fluid circulation to the discs. It creates a compression and expansion. One of the reasons discs degenerate and don't regenerate well is due to the passive nature of the fluid flow to the discs. They are not vasuclarized like a kidney. The fluid flow to and from the disc is based on body movement such as walking and breathing. The rocking motion on the table facilitates this fluid flow as good or better than perhaps any other activity. The result is the infamous herniated disc (also referred to as ruptured or slipped disc) this leads to pressure on the nerve also known as nerve impigement. When a disc bulges against one of the two sciatic nerves, which run from the spinal cord down the legs, the pain can be excruciating. This bulge can also take place in the cervical area which affects the neck, shoulders, arms and hands. We have no way to verify this scientifically, however, we have been working in the field of back problems and inversion therapy since 1980 and it has been our observation that there may be a correlation between diuretic therapy and disc problems. Long term use of diuretics to help control high blood pressure may contribute to disc desiccation which is described above. 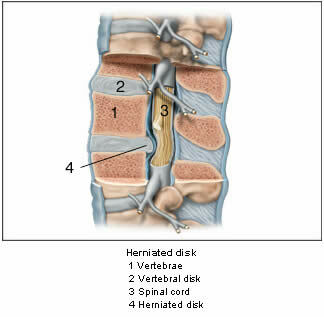 Most people who have disc problems may have one or two compressed, herniated or ruptured discs. We have found people who have disc problems and who are on diuretics seem to be more likely to have 3-4 or even more compressed discs than the person who is not on diuretics. Also when we hear someone has sciatica on both sides, this is often a sign to us they maybe on diuretics. When people tell us they have 5 compressed discs and we ask if they are on diuretics, we are not surprised to hear that they are. They are surprised when we ask them the question because they had never made the correlation before. We have even spoken with nephrologists (kidney and blood pressure specialist) and they had never made the correlation either but believe there maybe be a causal relationship. To our knowledge we are the first to make this observation. If you are taking diuretics you should be aware of this issue. 4. Swimming - This is a marvelous way to get good exercise that is easy on the joints and can relax, strengthen and balance the muscular system that aligns and effects the spine. Sacroiliac joint dysfunction which is different from sciatica responds very well to swimming as well. Sacroiliac is actually a sacroiliacitis or inflammation of the sacroiliac joint. The sacroiliac joint connects the sacrum (triangular bone at the bottom of the spine) with the pelvis (iliac bone). It transmits all the forces of the upper body to the pelvis and legs. There is not a lot of motion in the joint and it is very strong. Sometimes all it takes to create a sacroiliac problem is to lift something the wrong way. Sacroiliac tends to be a self limiting problem that usually will self correct within a few weeks. After the initial acute phase (where ice is recommended) a great therapy is first relax in a hot tub then swim for while. 5. Bike Riding - Especially up hills. Regular bike riding works mostly the calves and thighs. Although an excellent exercise that may be quite beneficial for the body in general and specifically good for movement in the sacroilliac joint and circulation that may benefit the discs - regular bike riding does not adequately work the muscles that are needed in order to align the pelvis. When you are working hard riding a bike up hill or are in a high gear where you may need to come off the seat you are then working the proper muscles for bilateral symmetry & alignment. These and other exercises may not be possible until after using the inversion table a while. Using the gravity traction properly should increased the intervertebral space and relieve the pressure on the nerve. Once the disc has had the pressure relieved it can usually start to regain is spongy shock abosorber properties and spacer function. Then exercises such as these can be eased into. Whether you are sitting in a chair, driving your car or on an airplane be sure to give your low back strong support with a proper lumbar supporting chair or a pillow. In an ideal sitting position the lumbar arch should be maintained. Allowing the shoulders to come forward and the low back to sag puts extra pressure on the lumbar region which may exacerbate low back problems. According to the Nachemson Study sitting in a chair creates about 50% more intradiscal pressure than standing upright. Also if back pain is chronic your bed may be too soft. We have been in the inversion field since 1980 and have had many people tell us that the inversion table has helped with their spinal stenosis problem. It is a natural therapy that gives the back movement and motion in ways it may otherwise not be able to achieve. It is very likely to help. Stenosis is a mechanical problem in some respects and inversion therapy is a mechanical solution. Often in the human body calcification will take place because of trauma or stasis. If a joint is immobile a therapy that mobilizes, lubricates, stimulates circulation and creates a rhythmic massage may be of therapeutic benefit. One technique many in the field believe is beneficial to helping spinal stenosis and to heal and regenerate the discs is to create a rocking motion. Often done for a few minutes AFTER a 15-20 minute inversion session at mild angles (coming up every 5 minutes or so to horizontal for a brief break from the traction). This rocking motion done after the inversion session creates a pumping action that facilitates circulation to the disc tissue which is infused by movement of the body. The rocking motion is done by rocking back to a 45 degree angle or so then rock forward so you are nearly upright then rocking back again. Doing this for a minute or so after a 15-20 minute inversion session creates an accordion like pumping action that many believe can speed the recovery of the discs. This rocking motion is only recommended when one has been using the table for at least a week or two (or longer) and when pain symptoms are NOT present. This rocking motion can create moment within the vertebrae that may help reverse the condition of spinal stenosis. If calcium deposits and calcium precipitating out of solution in the body and creating arthritic changes are of concern you may want to read this page on reversing arthritis and bone spurs: Often arthritis, bone spurs and spinal stenosis are a result of a chemical imbalance in the body that can be addressed nutritionally as well a mechanically. The Traction Handles which are standard on the Teeter Hang Ups EP-950 Inversion Table, Power Tables and can be an added feature on the Teeter Hang Ups F9000 Inversion Table are excellent for stretching and relaxing the spinal column. • In lumbar spinal stenosis, the spinal nerve roots in the lower back are compressed, or choked, and this can produce symptoms of sciatic pain -- tingling, weakness or numbness that radiates from the low back and into the buttocks and legs -- especially with activity. • Spinal stenosis in the neck (cervical stenosis) can be far more dangerous by compressing the spinal cord itself and possibly leading to major body weakness or even paralysis. This is virtually impossible in the lumbar spine, however, as the spinal cord is not present in the lower lumbar spine. The true spinal cord ends at approximately the L1 level, where it divides into many different nerve roots that travel to the lower body and legs. This collection of nerve roots is called the "cauda equina," which means horse's tail and describes the continuation of the nerve roots at the end of the spinal cord. One example of the many testimonials about scoliosis we have received. The pediatrician who had sent our daughter to the Scottish Rite hospital becasue she had a bit of a curvature in her spine, saw her for his referral last week. He was amazed at how straight her back was and asked her how she did it. She said that when she started using the inversion table, that in just a few months her shoulders were level and she had no more trouble will ill-fitting clothes due to one shoulder lower than the other - great, huh!? Everyone's spine has natural curves. These curves round our shoulders and make our lower back curve slightly inward. But some people have spines that also curve from side to side. Unlike poor posture, these curves can't be corrected simply by learning to stand up straight. 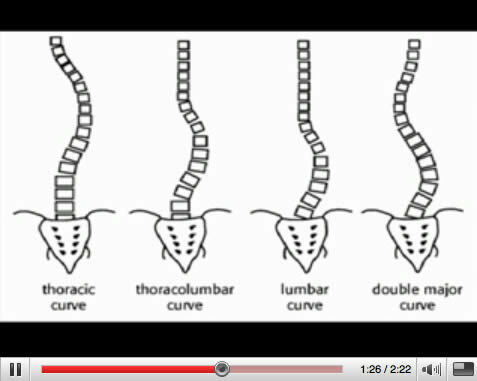 This condition of side-to-side spinal curves is called scoliosis. On an x-ray, the spine of a person with scoliosis looks more like an "S" or a "C" than a straight line. Some of the bones in a scoliotic spine also may have rotated slightly, making the person's waist or shoulders appear uneven. We have found in working with doctors & their patients for more than 20 years that inversion therapy can be a great adjunct in the treatment of scoliosis. In children as well as teens and adults the symptoms associated with scoliosis in many many cases are reduced when a person receives the benefits of gravity traction. In conjunction with stretching, exercises and inversion therapy we have also taken note of the benefits of daily deep muscle massage. Thismay be achieved with an electronic massager such as the Massage Mat with Far Infrared Neck Pillow. Also if muscles are particularly affected and a doctor is advised, in many cases a moist heat hydrocollator can be of great benefit. We have had reports from people who have used gravity inversion therapy for scoliosis and reduced pain symptoms in their lower backs they had previously accepted as chronic and intractable. They did not correlate these symptoms with the scoliosis but when they achieved benefits from the gravity inversion therapy they started for scoliosis a side or direct benefit was a relief from chronic low back pain that had become so common that they did not even realize how uncomfortable it was until it disappeared. Can inversion help children with scoliosis? Does age matter? Our medical advisor prefers to get patients involved with inversion as early as possible. Using inversion to help slow or reverse the effects of scoliosis is helpful at any age, but especially before the bones fully harden at ages 12-14. The size of the equipment may be an issue, so younger children will need an attendant. Children love inversion and many many scoliosis patients report excellent results after starting inversion therapy. It is a great way for parents to get involved in assisting their child. Also don't forget to be sure your child has excellent nutritional support. Three fantastic supplements that are great for anyone are New Vision's Essential Minerals, Essential Calcium & Essential Vitamins. There are many causes of scoliosis. Some causes may be problematic for inversion (bone infection, cancer, compression fracture). Most scoliosis in children is related to bone anomalies or calcification disorders, both of which do well with inversion. Of course, if you have any doubt, you should always consult with a licensed physician. We have found the stretch and straightening of inversion therapy to be beneficial in working with people with scoliosis. Many physicians who use inversion therapy recommend getting patients involved while they are still young and bones have not fully matured. Excellent nutrition is of course important in trying to prevent or correct a musculoskelital problem. The best calcium supplement we have found is Essential Calcium. Nutritious, delicious and easy to take as a sparkling beverage. And to be sure the body has the proper mineral balance we recommend the best selling liquid mineral supplement in North America - Essential Minerals. There are 26 vertebrae in your back which encase your spinal cord. (4 fused into one bone the coccyx). Your 23 discs act as shock absorbers. If they are compressed the nerves can be pinched. Traction had been the treatment of choice before pain relieving drugs and surgery came into common use. The benefits of decompressive traction are accomplished easier with an inversion table than perhaps any other known method. Spinal nerves run through each vertebral joint in your spinal column. There are 23 intervertebral discs. With no blood supply of their own, discs depend on sponge-like action to soak up nutrients and eliminate waste products. Many doctors believe rhythmic intermittent traction which is easy to do with an inversion table by creating a simple rocking motion may facilitate disc healing and regeneration. The pumping action of traction and compression may speed up the healing process. • Muscles and ligaments require regular movement in order to maintain flexibility. An imbalance or weakness in the strength of the muscles can affect the alignment of the spine & pelvis. A bilateral imbalance in this muscle strength (often the gluteus maximus) can lead to a tilting of the pelvis & nerve pain. The combination of proper exercise, nutrition and inversion therapy can greatly improve the quality of our general health and especially reduce or reverse previously intractable back problems. pain from hanging on an inversion table. If purchased at the same time as your table shipping is free. Increase decompression without having to go to more extreme angles.